[124 Pages Report] The sterility testing market was valued at USD 528.0 million in 2016 and poised to grow at a CAGR of 12.3% between 2016 and 2021, to reach USD 941.0 million in 2021. Sterility testing is conducted for the presence or absence of viable microorganisms capable of developing and multiplying under favorable conditions. Pharmaceutical, biotechnological, and medical device companies carry out sterility testing to investigate the quality of raw materials as well as process control and validation of end products. Sterility testing is used for bulk and final drug products, cell banks, and raw materials. The base year considered for the study is 2015, and the forecast has been provided for the period between 2016 and 2021. In pharmaceutical and biopharmaceutical industries, sterility testing is carried out at all levels of manufacturing to minimize the risk of product contamination. Subsequently, the growth of this end-use industry in the coming years will considerably boost the overall use of sterility testing. With stringent regulatory controls in place, process monitoring and quality control are carried out for the entire production chain of pharmaceutical and biopharmaceutical products. In this process, sterility testing is carried out for raw materials, bulk lot release testing, and final product release testing. According to the International Trade Administration, U.S. Department of Commerce, the global pharmaceuticals market is projected to grow from USD 1 trillion in 2015 to USD 1.3 trillion by 2020 at a CAGR of 4.9%. Strong growth in pharmaceutical and biopharmaceutical industries will drive the sterility testing market. During this research study, major players operating in the sterility testing market in various regions have been identified, and their offerings, regional presence, and distribution channels have been analyzed through in-depth discussions. Top-down and bottom-up approaches have been used to determine the overall market size. Sizes of the other individual markets have been estimated using the percentage splits obtained through secondary sources such as Hoovers, Bloomberg BusinessWeek, and Factiva, along with primary respondents. The entire procedure includes the study of the annual and financial reports of the top market players and extensive interviews with industry experts such as CEOs, VPs, directors, and marketing executives for key insights (both qualitative and quantitative) pertaining to the market. The figure below shows the breakdown of the primaries on the basis of the company type, designation, and region considered during the research study. 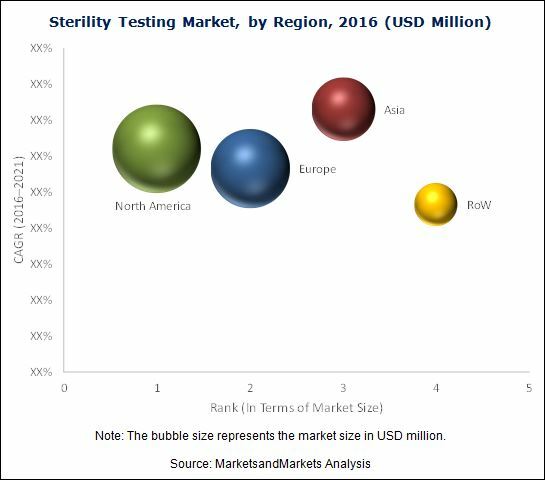 Key players operating in the sterility testing market include Merck KGaA (Germany), Charles River Laboratories International, Inc. (U.S.), bioMérieux SA (France), SGS S.A. (Switzerland), Sartorius AG (Germany), WuXi AppTec (China), and Thermo Fisher Scientific, Inc. (U.S.). In September 2016, Merck KGaA (Germany) launched Steritest Symbio Pump systems accessories. The accessories enable faster, safer sterility testing in any setting. In August 2014, Merck KGaA (Germany) launched Steritest Symbio Pumps. The product helps researchers in easier, safer, and more reliable sterility testing of pharmaceutical products in laminar flow hoods, isolators and clean rooms. In June 2014, Nelson Laboratories (U.S.) announced the expansion of its service offerings by adding the Technical Consulting Services group for MedTech companies. These services include product development, facility and process validation, product performance testing, and regulatory support. In November 2014, Merck KGaA completed the acquisition of Sigma-Aldrich Corporation (U.S.). The deal was valued at USD 17 billion. This acquisition helped Merck expand its business in various geographies and enhance its product portfolio. In August 2015, Danaher acquired Pall Corporation (U.S.). This acquisition helped the company to add Pall Corporation’s sterility filtration products to its existing product portfolio. What are new application areas which the sterility testing companies are exploring? The sterility testing market is expected to reach USD 941.0 million by 2021 from USD 528.0 million in 2016, at a CAGR of 12.3%. Sterility testing is an important and mandatory step in the manufacturing process to remove or inactivate potential bacterial contaminants. 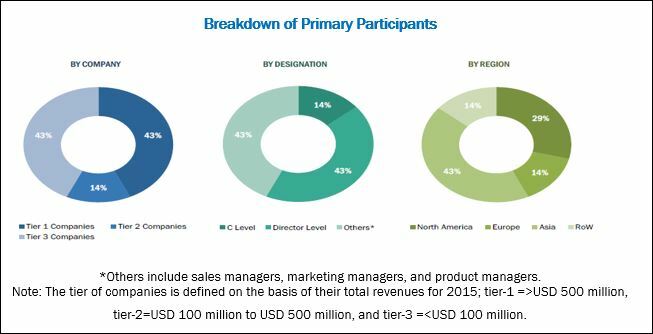 Growth in the pharmaceutical and biotechnology industries, increase in the number of new drug launches, and increasing R&D in life science research are the key factors driving the growth of this market. Sterility testing is a microbiological analysis to determine the presence of organisms in a given sample. It is carried out in a wide range of fields, including pharmaceuticals and biologicals, medical devices, water purification, food and beverages, and laboratory glass products. This process is mandatory at every stage in the drug development and production process. Sterility testing studies help analyze the effectiveness of each step of the manufacturing process to remove or detect bacterial toxins. Based on region, the global sterility testing market is segmented into North America, Europe, Asia, and the Rest of the World (RoW). The market is dominated by North America, followed by Europe, Asia, and the Rest of the World (RoW). However, the Asian market will witness the highest growth during the forecast period, primarily due to the increasing expenditure on life science research in the region and growing trend of pharmaceutical outsourcing to Asian countries like India and China. Growth in the outsourcing industry in Asia is another major factor supporting overall market growth in the region. The rapidly increasing demand for the outsourcing of microbial testing in countries such as China, India, Japan, and Singapore is expected to drive market growth during the forecast period. To capitalize on the opportunities in the Asian market, a number of companies have worked to increase their market share and customer base in the region. With stringent regulatory controls in place, process monitoring and quality control are carried out for the entire production chain of pharmaceutical and biopharmaceutical products. In this process, sterility testing is carried out for raw materials, bulk lot release testing, and final product release testing. In the medical device industry, the product sterility test is necessary for ensuring that medical devices are free from viable microorganisms. Some of the important medical devices tested for sterility tests include catheters, needles, orthopedic implants, contact lenses, anesthetic and respiratory equipment, and dental implants. What are the upcoming industry applications for sterility testing? There is a high degree of rivalry amongst market players, owing to which the market is highly competitive. Furthermore, the top players in this market are large and well -established, and enjoy a high degree of brand loyalty. New entrants in this market have to compete with existing players and differentiate themselves with innovative product offerings. The high degree of consolidation and the need for extensive R&D act as major entry barriers for new entrants. This is expected to restrict investments and thus the growth potential of this market. Furthermore, the requirement of high-capital investments and the high cost of R&D and manufacturing will also deter new players from entering this market. The major players in the sterility testing market include Merck KGaA (Germany), Charles River Laboratories International, Inc. (U.S.), bioMérieux SA (France), SGS S.A. (Switzerland), Sartorius AG (Germany), WuXi AppTec (China), and Thermo Fisher Scientific, Inc. (U.S.). These players are increasingly undertaking mergers and acquisitions, and product launches to develop and introduce new technologies and products in the market. 11.3 Charles River Laboratories International, Inc.